"I was at the entrance greeting the passengers. Sanath was the next passenger. I was surprised, but greeted him, saying 'Ayubowan!'... He was in extremely simple attire. Kept his bag on the ground and greeted me. And I still see that simplicity in Sanath. And that is something I really admire in him," says Sandra Tania de Silva Jayasuriya, the beloved wife of cricketer Sanath Jayasuriya. "I cannot remember the date, but the year was 1999. It was the 'Madras flight' Sanath was returning not from a cricket match, but from Thirupathy," she continues. Sure! 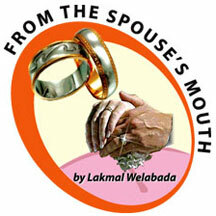 Sanath might have been returning after making a vow; looking for a soothing solution for his tormented soul. So his vow turned into reality, then and there. He met his future wife on this flight. "I was busy attending to the passengers. I had met Sanath before this at a birthday party of a friend. That day I went up to him to get his signature. And that was all. However six months had passed since I met him first. I introduced myself to him. He said 'good bye' when getting off. I had met many prominent figures on board as an Air Hostess, so meeting Sanath, the cricketer was also just another encounter. Sandra returned to her home at Kochchikade, Negombo and was reading a magazine when her mother peeped into the room and handed over the hand-telephone. "Hello, yes, Sandra here," she spoke. "Hi, hope you remember me. I'm Sanath Jayasuriya," she heard from the other end. Sandra paused a moment to gather her thoughts. A pleasant surprise, but what did 'Sanath', the cricketer have to do with her? She was bewildered, but composed. Sanath had dug her number out from her friend. But, why such a special interest? Sandra thought, must be for fun! However she couldn't resist when the famous 'Man of the Match' asked her for her mobile number. After nine months the two gradually realised that they were for each other. However, Sandra's father who was a great fan of Sanath until he heard about his darling daughter's affair became an irritated opponent of the Black Cricket Prince. "His fame would bring you a tough time," was her father's opinion."Eh! you will get a 'black' party. All your children will be pitch dark like him. I would feel like throwing them out of our boundary," her mother was sarcastic throughout pointing out the contrasts between the sun burnt cricketer and the beautiful fair Sandra. Even her only younger brother was not in a proper shape of mind to accept him. Whatsoever, finally true love triumphed. Sanath became the 'Man of the Series' once again not on the pitch, but in his real life. After nine months of their meeting in Madras, on June 19, 2000, Sandra and Sanath promised before God to be together until death do them part at a private Mass held at St. Jude Cathedral, a small chapel at Mattegoda. The Mass followed a family Reception along with a few close relatives and friends at his Boralesgamuwa residence. "Before one week of the marriage a Pirith Pinkama conducted by the Buddhist priests at Vapikaramaya, Boralesgamuwa was held, and both families took part. On the same evening of the Reception, Sanath had a match in Galle. I joined him. We had our honeymoon there," she smiles. Sandra studied at Ave Maria Convent, Negombo and sat for her A/Ls in Languages. "My dream was to become an air hostess. It tossed into my mind along with a wish of a good friend of mine. 'I wish you would be a lovely Air Hostess one day,' was what she wrote in Sandra's book of autographs. "I didn't know who an Air hostess was, and asked my father about it. He showed me a tour journal comprising an Air crew and explained. I was about twelve years then. Since then I started collecting pictures of Air Crew. And just after A/Ls, before I got my results I joined Air Lanka. I have visited 28 countries and 33 destinations," she says. "I worked about ten years. But I always wanted to be like my mother one day - a housewife. My father retired as a Airport Representative for Trans Asia Hotel. My mother's world was us, her family. So before marriage I quit. It was my decision and not his," says Sandra. Within the past seven years three little members entered the nest of Sandra and Sanath - two daughters and a son. Savindi is five and half years, Yalindi is two and half and little Ranuka is 11 months. "I got Dengue in the seventh month when I was pregnant with our son. Luckily it was diagnosed at the very inception and I was hospitalised for 12 days. It was a nightmare! Also the doctors said it was a girl for the third time as well. I was upset as I was yearning for a boy. However I made up my mind to accept this. But at the theatre miraculously a boy came to me," she laughs. Question: Tell us how it's like to be the wife of a world famous Cricketer. How does his fame affect you especially with the female fans? Sandra: S..c..a..r..ing! (laughs). I entertain the genuine fans of his, I mean whether it's males or females, I don't mind. But there were times that his fame bugged me, especially with feminine fan clubs who were enticed and mesmerised over him. But I clear my doubts then and there with him. I don't bottle up things inside (laughs). He treats everyone equally. "When cricket is not right, nothing is right with him. He is extremely punctual for Cricket practices. First, I wondered what was going on with him. He was always on the move. Later I realised his passion for the sport. I noticed the BIG smile on his face after winning a Match, and when he lost, the bad tone. Even in sleep he worries about the loss, especially if he has lost due to a careless shot. We rarely get free time. But, recently we went to England for two months and enjoyed it thoroughly. No one knew him and he had only us. I felt like not coming back," she laughs. "I used to go everywhere he went. I still do whenever I can, but, now my priority is my children. I want to give them the best education and then the simple life which Sanath follows. I do like it if our son plays Cricket too. Question: What are the bad qualities you see in him? Question: How does he face difficult situations? Sandra: Things are mainly put on to me. He prefers a calm and quiet atmosphere. When things are on pins he might move to the gym. So when he returns everything is in its proper order. He likes a carefree life. But that doesn't mean he neglects the family. No, no, don't take me wrong. But you can't drag him to a serious argument. Basically you can't argue with him as he starts laughing. Meal time is the best time to start a serious conversation with him as he is not pre-occupied then. Sanath rarely gets angry. All three little ones are very much attached to Sanath. Both daughters are almost on top of him when he is at home. He likes to get his legs massaged. They know about it and love to put cream and give the best massage to their father. (Little Ranuka begins to chew his own shoe while on Thatha's lap. Next moment he starts to lick his father's face). Question: Common interest of both? Sandra: The day I became a mother. Then meeting Sidath Wettamuni (laughs). Well I was a fan of veteran cricketer Sidath when I was schooling and used to collect his pictures and paper articles. So after we got married Sanath took me to Sidath's place. It was the first time I met him. I was so happy and couldn't believe myself that I was sitting just in front of Sidath. 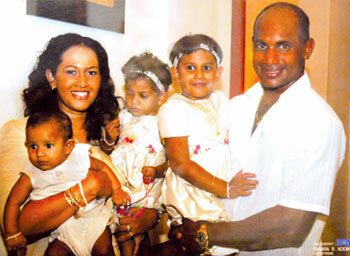 Sanath told Sidath's wife Sharmini that his wife had been a great fan of her husband. (laughs) Well, also I'm a fan of Bryan Lara as well. I wanted to get his signature, but was too shy. So at the recent World Cup, Sanath took my autograph book and got Lara's signature. I've asked Sanath to invite Lara and his family home, but he hasn't done that yet. He might be a little jealous about me being a fan of Lara. Question: What do you want to see in him most? Sandra: I love to see him getting century after century. And then to have more time for us. And also not to get caught to dishonest people. Some opportunists try to trap him by using his fame. That really makes me mad. Question: Politics? How would you mind his involvements in politics? Sandra: Oh, Gosh! No way! Simply no way! A big no way! Question: What really attracted you towards him? 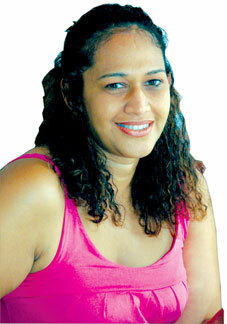 Sandra: Sanath knows how to approach his targets. He makes you feel secured in his hands. He somehow won the consent of my family as well. Now they are best buddies of his. My parents have been with me and my family throughout. Though my mother said I would get 'black' children and she would throw them out, she has been the very person behind all my kids. Luckily my little ones are not dark, but mid complexioned. Sandra: His parents are ok. I'm grateful to his mother for giving me a son like Sanath. The credit should go to her. "I'm Roman Catholic and Sanath is a Buddhist. Our children basically follow Buddhism, and learn the spirit of both religions. I don't want certain labels on them, and want my children to be good citizens. I accompany Sanath and the children to the temple and he comes with me to the church. I'm not that much of a 'church-person', but every morning I pray to God and give myself and my family into his hands, and I try my best to have a clear and pure conscience".